This Sunday is the Feast of the Epiphany of the Lord. The word means "manifestation" and comes from the Greek word "to reveal". It is the celebration of God's self-revelation to humankind, including to the Gentile world. It is the fulfillment of prophesies of old that "all nations will walk by your light". In our first reading (Isaiah 60:1-6), we hear Isaiah's prophesy near the time of Judah's release from Babylonian captivity and restoration to Jerusalem - a prophesy only partially fulfilled at that time, a New Jerusalem was yet to come. Our Gospel reading (Matthew 2:1-12) is the story of the three wise men from the east coming to bring gifts and praises to the newborn King of the Jews. These Magi represent the non-Jewish Gentile world recognizing and paying homage to the One True God made flesh. With the guidance from an angel, they thwart Herod's plan to destroy this rival King as they return to their land by another route. 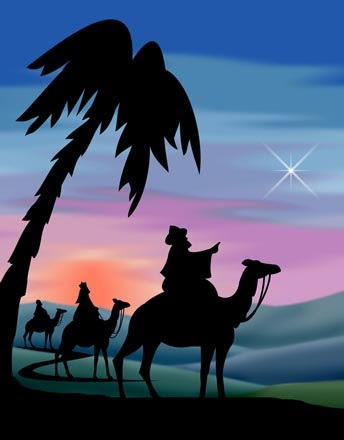 When Jesus was born in Bethlehem of Judea, in the days of King Herod, behold, magi from the east arrived in Jerusalem, saying, "Where is the newborn king of the Jews? We saw his star at its rising and have come to do him homage." When King Herod heard this, he was greatly troubled, and all Jerusalem with him. Assembling all the chief priests and the scribes of the people, He inquired of them where the Christ was to be born. They said to him, "In Bethlehem of Judea, for thus it has been written through the prophet: And you, Bethlehem, land of Judah, are by no means least among the rulers of Judah; since from you shall come a ruler, who is to shepherd my people Israel." Then Herod called the magi secretly and ascertained from them the time of the star's appearance. He sent them to Bethlehem and said, "Go and search diligently for the child. When you have found him, bring me word, that I too may go and do him homage." In our Epistle reading (Ephesians 3:2-5, 5-6), Saint Paul explains that, through the revelation of God, the Gentiles are coheirs and copartners to the Kingdom of God. You have heard of the stewardship of God's grace that was given to me for your benefit, namely, that the mystery was made known to me by revelation. It was not made known to people in other generations as it has now been revealed to his holy apostles and prophets by the Spirit: that the Gentiles are coheirs, members of the same body, and coopartners in the promise in Christ Jesus through the gospel.